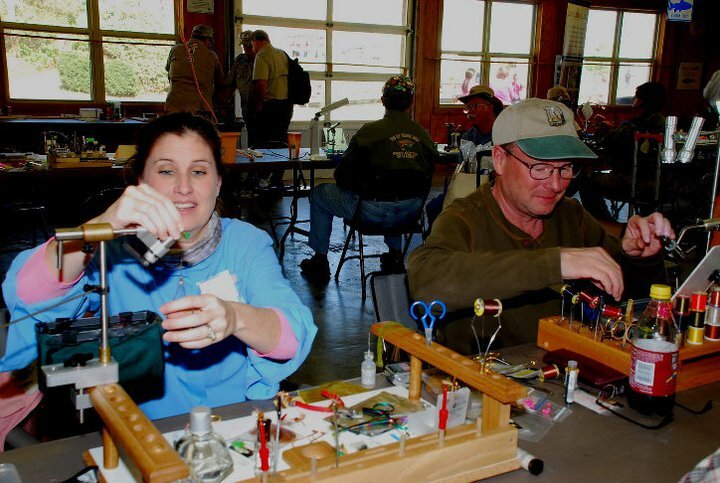 Once a year, the TPWD's Texas Freshwater Fisheries Center in Athens hosts an all-day fly fishing extravaganza. Many area fly fishing clubs converge on the TFFC facility to teach fly casting, fly tying, rod building, seminars on places to fish throughout our state, different kinds of water crafts used to get up into narrow saltwater lake flats or small creeks, different styles and types of fly rods, and what it looks like to catch a fish with a fly rod. The theme of the 12th Fly Fish Texas was "Tie a fly, cast a fly, catch a fish." Cody and I volunteered to demonstrate catching fish. Usually we are in the catfish aquarium casting to 20+ pound catfish, but due to a newly purchased filtration system and not-knowing when funds will come around again to purchase another one when this one wears out, we were not allowed to fish the catfish aquarium. Those catfish take any where from 20-30 minutes to land, and they fight and muck up the water, so we understood their reasoning, but we were disappointed. We weren't denied total access, though. The trout stream exhibit was this year's fishing spot, so the public had a great eye-level view of the fish, could watch us cast, and see our fly underwater, watch fish chase our flies, and see fish caught. Yes, it was casting in aquarium, but how many people say they cast to captive fish? Even at Bass Pro Shops, they clip the hook off the fly. Fun, fun, fun! The TFFC staff saved two nice 16" trout--one rainbow and one brown for the trout aquarium just for us to catch, and so I obliged them by catching the rainbow. I fished my 4# TFO Finesse rigged with a 150 grain Sharkskin line. Unfortunately, I chose a 6.6 lb tippet. Entertaining a crowd of about 25 guests, I caught that rainbow using a red-lipped CodyBugger, and FishOn--for 10 minutes. Just after the fish's second jump, she broke that tippet clean off. About 30 minutes and 45 minutes after losing that beautiful rainbow, new guests kept commenting that they knew I had caught her, because they could see the fly still in her mouth, and yes, I use barbless hooks. Overall, I netted a Largemouth Bass, four Rainbow Trout, one of the most beautiful Bluegill I have ever seen, and two Black Crappie, one was a monster of a crappie. As much fun as it was and even though Cody appeared in his first magazine in 2006 fishing this same spot, Cody forwent fishing for the day. I gave Cody his Easter present early, just for this occasion--a pair of Simms G4Z waders, but Cody said he didn't want to get them dirty! ﻿Having completed the DFF's time slot for catching fish, Cody and I chose to tie flies. Cody demonstrated tying Crystal Midges, CodyBuggers, and GirlieBuggers. I tied Bonefish Bitters, and concocted some on-the-spot, crazy crab pattern. I will be interested to see how it fishes. At lunch, we met up with other DFF volunteers, and Diane Blair said she taught about 100 people fly casting; Malcolm Duke said he had seen about 25 people per class he was working. I don't know how many people attended, but looking throughout the facility, visitors, experiencing all facets of fly fishing, could be seen all day. At the end of the day, the TFFC holds a raffle. In previous years, both the public and volunteers could purchase tickets for the raffle. However, the TFFC staff said that for the quality of items, the raffle did not generate much money from the visitors, so this year, they decided to hold the raffle for the volunteers, as a thank-you. Both Orivs and TFO donated a Batenkill reel and BVK rod, respectively, to the raffle, and two Project Healing Waters veterans won--a fitting end to a great day! We love Fly Fish Texas and can't wait for 10 March 2012 and the 13th Fly Fish Texas!